The Common Bacu or Pterodoras granulosus is another of my favourite large catfish, which I currently have the pleasure to keep. At the moment I have three of these "gentle giants" housed within my 12' x 3' x 4' tropical pond. They vary in size from approximately 600mm (24") to 900mm (36"). Two well-known "Catfish Fanatics" initially purchased all three catfish at the same time in the South of England - Tony Tyson and Terry Wilkins. I was asked to rescue one of these catfish from Terry as it had outgrown its accommodation namely a 72" x 24" x 24" aquarium. At the time of its transfer to my tropical pond it was approximately 20" total length, some two and half years later this fish is closer to 36" total length. This catfish was given the name "Well Ard" and the name has stuck. (For our international audience I should point out that "Well Ard" alludes to the fishes hardy nigh on indestructible nature - Ed). I quite often get people asking me how Well Ard is doing. I purchased the other two catfish from Tony and introduced them to the pond a couple of months later when they were approximately 6" in length. These two fish are now approximately 24" long and are eating anything that is offered to them including catfish pellets, floating food sticks, pond pellets, whole prawns, mussels, cockles and earthworms. My observations of these fish suggest that I might have two females and one male, as I have two rather fat catfish and one, which is more slender. I have not seen any obvious signs of spawning activity to date, but these catfish are quite happy to swim around the pond together. Of the three catfish Well Ard is perhaps the tamest of the three allowing me to feed her by hand! These catfish are kept in with a number of other large catfish including Pseudodoras niger, Megalodoras uranoscopus, Leiarius pictus, Auchenoglanis occidentalis and numerous Synodontis species. Due to the size that these catfish can attain keeping them in anything smaller than a 72" x 24" x 24" aquarium should not be considered, and it should be pointed out that even this size aquarium is really a little too small! Whilst fish collecting in Peru two years ago with a number of members of the Catfish Study Group (UK) including Jools & Clare Dignall, Allan James, Giles Barlow, Robin Warne, Steve Pritchard, Terry Wilkins and Alan Appleton, we caught a couple of these catfish on rod and line. They were to spend the next few days on board our accommodation for the week, only to be returned to the point at which they were caught originally. I decided that the three specimens that I had at home already were enough and that they would be better off swimming in the Amazon! In South America the local inhabitants would catch and eat these catfish, and as you can imagine a large specimen would feed a whole family for a few days. Seeing these catfish in their natural habitat was an amazing experience, one that will live with me for a long time to come. The common bacu are found throughout the river systems of South America. The colour pattern of these catfish varies depending upon the location that they originate from. These fish are usually a muddy-brown colour with some darker spots over the body and fins. As these fish mature the spotting tends to fade. 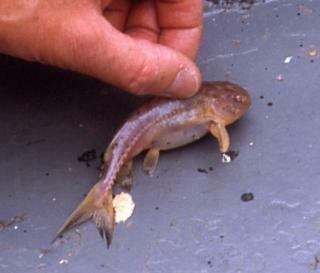 Juvenile specimens tend not to be as dark coloured as adult fish, in fact the two specimens caught in Peru were light brown/tan in colouration. The body of these catfish is best described as being robust. The body is naked i.e. it is devoid of scales, but the skin is very thick and tough. There are between 23 and 28 shallow lateral plates known as scutes along the length of the body. Their eyes are very small in comparison to the rest of the fish and they have three simple pairs of barbels. They have a deeply forked caudal fin, which also helps to distinguish this fish from other large Doradids. In their natural habitats these catfish are migratory, shoaling in large numbers as they make their journeys upstream to spawn. Etymology Pterodoras: From the Greek pteron, meaning fin, and doras, meaning skin (also a word commonly used in forming generic names for doradids); in reference to the forked caudal fin. Size 920mm or 36.2" SL. Find near, nearer or same sized spp. Sexing There are no reported external sexual differences. Personal observation shows that females tend to be more heavily built/robust than the males, which tend to be slender. There may also be differences associated with the structure of the head as with the Synodontis catfish, but further observations need to be made. Distribution Widespread throughout most of the larger river systems of South America. Other Parameters Wamer water will be tolerated at least for a period of time. It is documented that keeping these fish in water with a pH value above 7.5 can cause skin and eye cloudiness. Feeding Omnivore feeding on a very mixed and varied diet including catfish pellets, earthworms, whole prawns, mussels, floating sticks/pellets and snails. In their natural environment they would feed upon snails, aquatic plants and fruits. See also natural feeding behaviour paper in the references section. Furniture Large pieces of bogwood are ideal. Large diameter pipe can be used but it should be large enough for the catfish to easily fit in without becoming stuck. I have managed to create two shady areas within my tropical pond, by covering the ends with decking, where these catfish prefer to hide until feeding time. Compatibility Ideally suited to life with other large fish. 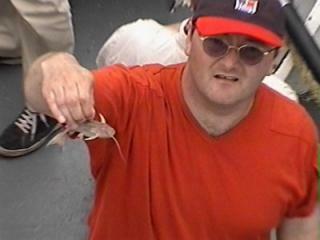 These catfish are not predatory but would mistakenly take a smaller fish if hungry. Suggested Tankmates Other large catfish such as Leiarius, Megalodoras, Oscars and larger characins.